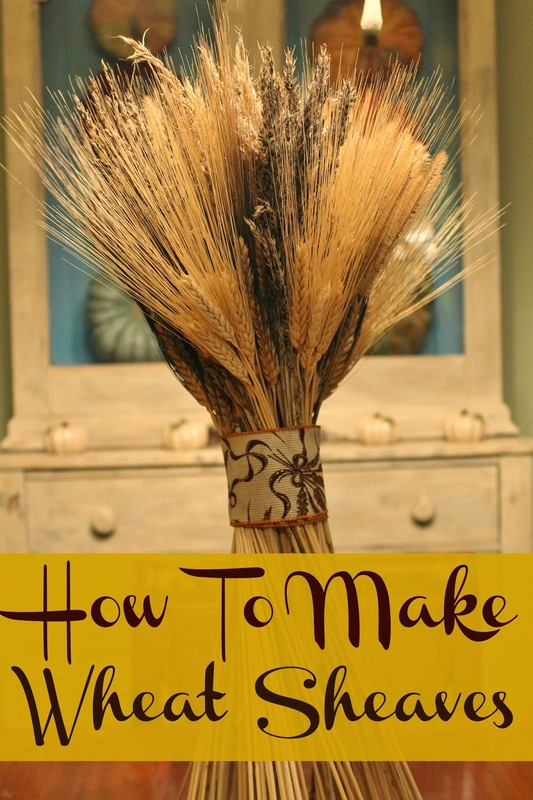 One iconic symbol of Thanksgiving is a wheat sheaf. It symbolizes a rich and plentiful harvest. strong but a stalk by itself will bend and break easily. to the wheat to add interest to the sheaf. house, I could make an inexpensive sheaf. There were several different types of weeds to cut. I tried to keep the types and sizes separate. after the green leaves had been stripped off. stores starting looking like a good deal (especially on sale). I had to work with to make wheat and grass sheaves. and grass in a sheaf so it must not be too tacky. applied to expose/activate the stickiness. sheaf look fatter than it actually was to save materials. twisting helps the sheaf to stand on its own. I hated just covering up the bundles in the center more. stems straight across at first. part of the whole project...making the sheaf stand alone. left me with some wheat and grass left over. side of the large sheaf. For these, only wheat was used. .
quicker than the first one, I did not tape bundles together. few stalks at a time with the floral tape. With this technique, the tape stayed at the same level easier. not use all the wheat up with these two sheaves. sheaves stand on their own. Maybe I didn't twist enough? Too tall with a smaller amount of stalks? Didn't cut the bottoms right? Don't know. container and added dried white beans around the stalks. before placing the beans around the stalks. enough to cover the tape, the sheaves don't really show up. The ribbon cuff was just hot glued on the sheaves. he ties in well with the grass and wheat sheaf. in my lap to get home. Yikes...still had wheat and grass left over! place where ribbon would not cover it. the grass heads) to use on the kitchen table. These sheaves were wrapped with burlap ribbon. some floral picks arranged around them. stems a little shorter than that. with company coming, I couldn't mess up the dining room again. Push the hand held bundles into the beans in the vase. Keep adding more bundles into the beans. You could use another shape vase also. This one gives kind of a contemporary spin on a wheat sheaf. This way to display wheat was the fastest one I tried. and am just now getting the project finished on Thanksgiving!